Donald Trump: Being an Atheist Gives Me a Business Edge-Fiction! - Truth or Fiction? 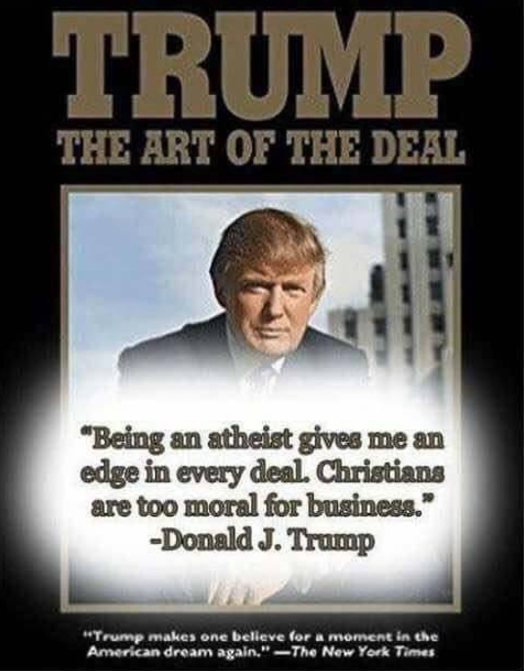 President Donald Trump wrote in his 1987 book “The Art of the Deal” that being an atheist gives him a business advantage because Christians are too moral. President Trump didn’t say that being an atheist gave him a business edge in “The Art of the Deal,” or anywhere else. False claims that Donald Trump said being an atheist gives him a business edge emerged in July 2017. However, searches for the keywords “atheist” and “Christians” in electronic versions of “The Art of the Deal” turn up zero results. That means that the quote in question — or any other quote about atheists or Christians — doesn’t appear in the book. The claim that Donald Trump said being an atheist gives him a business edge is similar to a rumor about Trump being an atheist that surfaced during the 2016 presidential campaign. In that version, Trump supposedly said during a 1989 appearance on the Phil Donahue Show, “I have a really high IQ, Phil, I mean, c’mon. It’s impossible for me to not be atheist.” We investigated that report and found it be fiction. In reality, there’s no record of Donald Trump admitting that he’s an atheist, and accounts of Trump being a Christian date back to the 1980s. CIA Agent Confesses on Death Bead: We Blew Up World Trade Center on 9/11-Fiction! Get 5,000 Kroger Fuel Points on Social Media-Scam!